At Appleton Auto, we offer the area’s best pre-owned vehicles. And as a 199ride dealership for the people, our large selection of used cars are backed by a Worry-Free Guarantee. This means when you buy a used car from Appleton Auto, it’s a whole different car buying experience than when you buy somewhere else. View our entire pre-owned vehicle inventory online, or visit the dealership at 1131 N Bluemound Dr, Appleton, WI 54914. Plus, Everybody Rides at Appleton Auto! We know that a lot of you suffer from past credit problems, and that’s why Appleton Auto offers the Everybody Rides program. 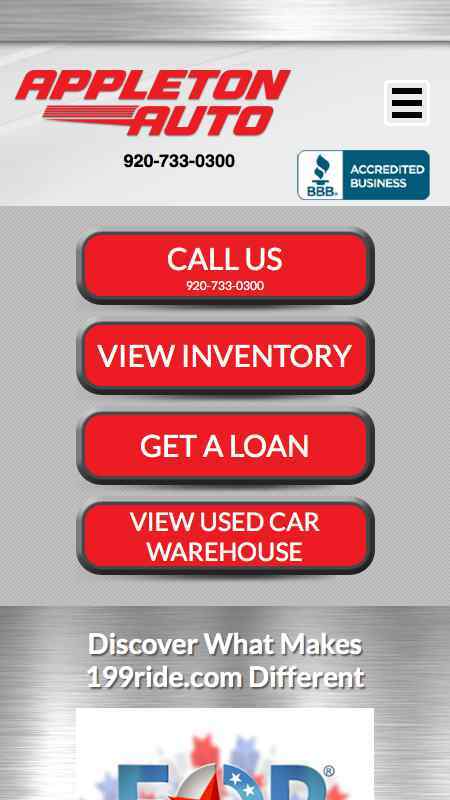 In fact, helping people with credit issues get approved for the nicer, newer used car they want is what we do everyday. It’s what we specialize in. We have valuable relationships that we’ve built with special lenders and funding sources that can help us solve even the toughest credit situations. Hold your head up high… We’ve got you covered!